Codara Bracy and Kineh N'gaojia in In The Master's House There Are Many Mansions. Photo by Daniel Coston. BOTTOM LINE: Haunting and ambitious, In the Master’s House There Are Many Mansions tells an all-too-familiar story of life, death, and violence. A familiar and somber story in an unfamiliar light—this is what In the Master’s House There Are Many Mansions, a drama blending performance art and prose from Charlotte, North Carolina's Twilight Repertory Company, sets out to tell. The show is chilling and stunning in its simplicity. It is 1976 in San Francisco. Larry James Fletcher (Codara Bracy) is visibly shaken as he steps off the bus and walks into a mortuary in town to pay his final respects to Tyrone (Kineh N’gaojia), a childhood friend and the most recent victim of police violence. Left alone to mourn by an aloof and distracted mortician (Jay Morong), he has to face the reality of what is before him. Tyrone is dead, but not really. As Tyrone rises from the table in his clean, white, silk suit (which Larry covets for his own), he and Larry reminisce. They are both victims of a world engulfed in violence, with shared experiences, some isolated to specific marginalized communities. There are fragments of the recent war and its aftermath everywhere, especially in Tyrone: murder across continents that we, as a country, sanctioned then, along with the war on black bodies we continue to sanction now. In this story, the victims are interchangeable. Aren’t they always? How many days do we go before one trending hashtag, the name of a black man or woman killed under police fire, is replaced by another? How long until all the names and details blur together, and the people who should be paying attention just see a sea of similar faces in their best suits? In the Master’s House stays with you, but unfortunately loses some of its effect due to some unconvincing acting. Bracy and N’gaojia play their characters effectively—naïve and deliberately intense, respectively—but in a familiar story, they need not try to sell it as hard as they sometimes do. However Hill, who serves as the show’s percussive instrument, tapping at regular intervals with an exquisite two-piece jazz ensemble (Noel Friedline on piano and keyboards, and Tim Singh on bass), needs no words— he is expressive and brilliant. With him, Bracy and N’gaojia have permission to fade into the background at times. 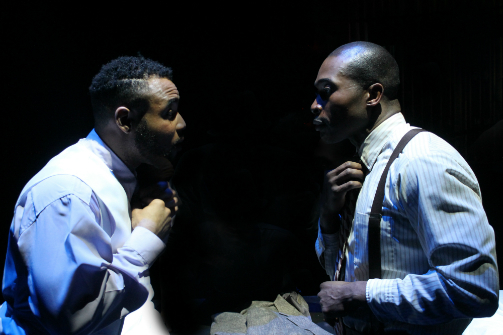 A scene where Larry and Tyrone recall moments of their lives and sing together (a moment you would think would be front and center), while Hill dances between them and the audience, is a testament to Jackson and Vesce’s judgment. A challenging piece of art, the biggest misstep of In The Master's House is tipping its hand in the show’s synopsis: “In the chilling embrace of the embalming room he discovers who the real victim is.” You don’t know the route, but you know the destination. With death constantly lingering, especially post-Vietnam War, and especially with black men being targeted, maybe that’s the unfortunate point. In The Master's House There Are Many Mansions is by Cherry Jackson. Directed and produced by James Vesce. Choreography is by Khaled Hill. Musical Direction is by Noel Freidline. Production Design is by Paula Garofalo. Lighting Design is by Matt Fergen. Stage Manager is Matt Miller. The cast is Codara Bracy, Jay Morong, Kineh N'gaojia, and Khalid Hill.